"41AN1-3, Burial E-1" by Timothy K. Perttula and Robert Z. Selden Jr.
DECORATION: The rim has a cross-hatched incised motif; there are also two small appliqued nodes on the rim, just under the lip. On the remainder of the vessel, beginning at the rim-body juncture, are vertical rows of large tool punctations. These punctated rows reach to the base of the vessel. 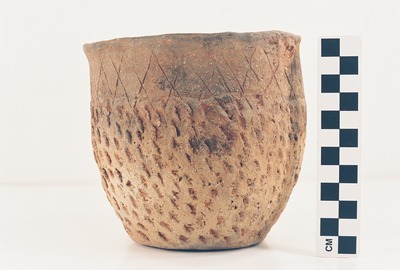 Possible Maydelle Incised jar (Vessel 41AN1-3).